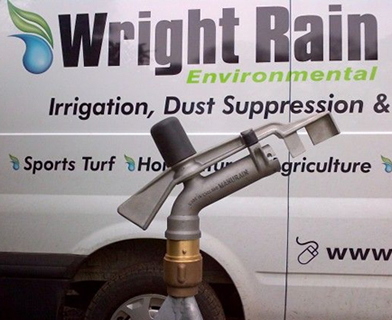 The Wright Rain Manurain Sprinkler, designed & manufactured in England, and used throughout the world is an efficient, low-maintenance full circle rotating sprinkler specifically designed for the handling of slurry. It will operate over a wide range of pressures (1-5bar), and will distribute slurry evenly over a wide area. A special non-clog rubber nozzle permits the passage of solids larger than the nominal diameter of its orifice, virtually eliminating blockages. 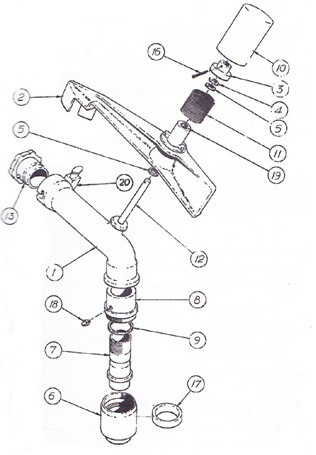 If, however, a blockage should occur, the nozzle can be removed or replaced in a matter of seconds. The whole unit has been designed to give long, trouble-free service under year-round farm conditions, without the need for skilled maintenance. The sprinkler body and swing arm are strongly made of corrosion resistant cast aluminium; the swing arm spring, made from phosphor bronze and fully protected, can be simply adjusted in the field for optimum performance, whilst a sealed brass and nylon bearing prevents wear through the intrusion of abrasives. Why not take a look at our videos to see more?